The 12th Personalized Medicine World Conference (PMWC) and the first on the East Coast of the United States was held May 24-25 at Duke University in North Carolina, and featured major biotech and medical figures from around the world. The meeting was opened by Program Co-Chair Ralph Snyderman, MD, Chancellor Emeritus, Duke University, James B. Duke Professor of Medicine, Duke University Medical School, and Director of the Duke Center for Research on Personalized Health Care. Dr. Snyderman said that with the completed sequencing of the human genome in 2003, there was a vision that health care would be transformed by new technologies and genomic advances, and that already remarkable progress has been made toward extending the healthy living and longevity of every person. He highlighted the strengths of Research Triangle Park and compared it favorably with Silicon Valley, particularly with respect to innovation. He paid tribute to the meeting co-hosts: Duke, Duke Health, Johns Hopkins University, Intermountain Healthcare, and UCSF, and then called upon Tal Behar, Co-Founder and President of PMWC International to say a few welcoming words to the over 400 meeting registrants. Tal said the PMWC was thrilled and honored to be at Duke for the first East Coast PMWC meeting and she thanked the meeting co-chairs, Dr. Snyderman and Geoff Ginsburg. MD, PhD, Professor of Medicine and Director of the Duke Center for Applied Genomic and Precision Medicine, for their efforts in organizing this truly spectacular meeting. She wished everyone two very productive days and then called on Dr. Ginsburg to make a few opening remarks. Dr. Ginsburg emphasized that precision medicine involves the convergence of many fields and focuses on the centrality of the patient. He noted that the drive to convergence requires productive collisions and he hoped that productive collisions at this meeting would provide the spark to make precision medicine a reality. Dr. Ginsburg then introduced Duke’s Mary A. Klotman, MD, Chairman of the Department of Medicine, and Dean-Elect of the Duke University Medical School. She raised the question of how to move the drive of quantitative science into the clinic, and she noted that this meeting is part of a critical revolution of learning that will help harness the power of precision medicine to change health. Next, Dr. Snyderman returned to the podium to introduced a highly honored guest, North Carolina Governor Roy Cooper(D), who took office in January 2017. After noting that Governor Cooper, had strayed briefly by getting his undergrad and law degrees just down the road at the University of North Carolina, Dr. Snyderman applauded the Governor’s stances on health, education, diversity, and the common good. In particular, he noted that Governor Cooper has appointed a cabinet that is the most diverse in state history. The Governor came forward and graciously thanked Dr. Snyderman and Tal Behar for their efforts and he warmly welcomed the over 400 attendees to an epicenter of health and medicine and hoped they would come back for years to come. He noted that 10 million people live in North Carolina and that he works for all of them—with particular concerns for better education, better health, and the opportunity to live more abundant and purposeful lives. One of his goals is to make North Carolina one of the top ten educated states by 2025. He mentioned his plans for Smart Start for early education and his plans to develop free community colleges. He emphasized the need to invest in mental health, particularly for substance abuse problems such as opioid addiction which is a huge problem in North Carolina. He said “we can’t arrest our way out of this problem.” He mentioned tha RTP has been the home of many cutting-edge discoveries, including taxol and AZT . He intends to keep encouraging this kind of innovation to improve the lives of everyday North Carolinians. He said we should work together to build better lives for everyone and he expressed his admiration and thanks to everyone for coming to North Caolina. 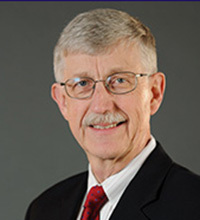 Next, Dr. Snyderman introduced NIH Director Francis Collins (photo), MD, PhD, as “the most important scientist in the biomedicine field in the last 20 years,” who has been responsible for many spectacular advances, including the positional cloning of the cystic fibrosis gene. While Dr. Collins was Director of the National Human Genome Research Institute, he led the public Human Genome Project, that culminated in the complete sequencing of the human genome, an amazing feat that opened our eyes for the first to predictive rather than reactive medicine. In 2009, Dr. Collin became Director of the NIH, where he has beeni involved in the launching of many major programs, including the Brain Initiative, the Cancer Moonshot, and the Precision Medicine Initiative, which is now called the All of Us program. In terms of patient enrollment, Dr. Collins said that 15,000 individuals should be enrolled by the time of beta testing of the system in a month or two. By the end of 2017, a total of 32,000 should be enrolled, and by 2012, the goal of 1 ,000,000 volunteers should be reached. Volunteers may join up online at https://www.joinallofus.org/. Dr. Collins then showed a brief moving video on the significance and potential impact of the All of Us program and this video is available on the All of Us web site. The next speaker was Dr. Ginsburg who spoke on “Implementing Genomics into Medicine--Locally, Nationally, and Globally.” He began by emphasizing the importance of constructive implementation and cited two examples of major projects for which implementation had not been successful and those were the Framingham Study and the lung cancer EGFR test. He noted the quote “Vision without implementation is hallucination,” and stressed the importance of implementing the findings of precision medicine down to the patient level in the clinic. He highlighted the IGNITE (Implementing Genomics in Practice network (https://ignite-genomics.org/), the North Carolina Precision Health Collaborative (NCPHC) (http://www.ncbiotech.org/Precision-Health), and the Global Genomic Medicine Collaborative, as highly promising precision medicine projects underway now. IGNITE is an NIH-funded network dedicated to supporting the implementation of genomics in healthcare. The network is comprised of six research sites, a coordinating center, a steering committee, and working and interest groups. The National Human Genome Research Institute and an external scientific panel provide oversight for all network activity. The six research sites are Duke University School of Medicine, University of Florida College of Pharmacy, Icahn School of Medicine at Mount Sinai, Vanderbilt University School of Medicine, Indiana University School of Medicine, and the University of Maryland School of Medicine. The NCPHC has the vision of advancing transformative, data-driven precision health and its mission is to accelerate collaborative initiatives that foster research, enable providers, engage industry, and empower citizens to improve health outcomes and optimize resource utilization in North Carolina. The Global Genomic Medicine Collaborative (G2MC) is an action collaborative among global leaders in the implementation of genomic medicine in clinical care. Arising from the 2014 Global Leaders in Genomic Medicine Summit, the purpose of G2MC is to identify opportunities and foster global collaborations for enabling the demonstration of value and the effective use of genomics in medicine. Engaging multiple stakeholders across the globe, the G2MC group seeks to improve global health by catalyzing the implementation of genomic tools and knowledge into health care delivery globally. To accomplish these goals, seven working groups were created, including communications, education, evidence, IT/bioinformatics, pharmacogenomics, policy, and a steering group to guide and support efforts among working groups. Dr. Ginsburg noted that the G2MC now includes over 50 nations around the world. Charles Perou, PhD, Professor of Molecular Oncology of the Lineberger Cancer Center at the University of North Carolina, spoke next on precision medicine studies in breast cancer and lung cancer. Dr. Perou’s lab has done major work in the genomic characterization of tumors, which resulted in the identification of five intrinsic subtypes of breast cancer. This gene expression-based classification was the first to identify the basal-like/triple-negative breast Cancer (TNBC) subtype, which has been translated into a test that is being used in the breast cancer clinic worldwide. Dr. Perou noted that, in cancer, it is necessary to look at multiple features and he said that his lab is currently using a variety of experimental methods on tumor specimens include RNA-sequencing (RNA-seq), DNA exome sequencing, whole genome sequencing (WGS), cell/tissue culturing, and proteomics, with a special focus on the basal-like/TNBC subtype. He also spoke of studies of lung cancer and the need to consider genomic data and pathology when assigning a cancer risk score. The next speaker was Vandana Shashi, MD, a pediatric medical genetics specialist and Professor of Pediatrics at Duke. Dr. Shashi spoke on “Undiagnosed Diseases: Resolving One Diagnosis at a Time.” She began by saying that rare, difficult-to-diagnose diseases, while rare on their own, are not rare at all when considered in aggregate, with 10% of the US population or 30 million people affected by these diseases. She added that as much as 80% of these diseases have some genetic basis. She then described the Undiagnosed Diseases Network (UDN) (https://undiagnosed.hms.harvard.edu/). This is a research study that is funded by the National Institutes of Health Common Fund. Its purpose is to bring together clinical and research experts from across the United States to solve the most challenging medical mysteries using advanced technologies. Through this study, members hope to both help individual patients and families living with the burden of undiagnosed diseases, and contribute to the understanding of how the human body works. Among the participating sites are Duke, Stanford, UCLA, Vanderbilt, Harvard, and Mass General. The theme of the UDN is “Solving Medical Mysteries through Team Science.” Dr. Shashi gave a few examples of where work through the network had led to profound and life-saving insight into dire rare diseases of children. In one case, a 20-month-old young girl in deteriorating condition was found, by whole exome sequencing, to have a mutation in a riboflavin transporter gene. Dr. Shasta administered high-dose riboblavin (1500x the normal dose) to the girl and she is now two years into the treatment and doing well. Dr. Shashi is a member of the North Carolina Rare Disease Advisory Council for the North Carolina Rare Disease Network (http://www.med.unc.edu/ncrarediseasenetwork). Later in the morning, Matthias Gromier, MD, Professor of Neurosurgery at Duke gave a riveting presentation on the use of oncolytic polio virus in the immunotherapy treatment of glioblastoma. He said that a strong polio virus receptor (CD155) is produced on glioblastoma cells, as well as on a number of other cancer cell types. The Duke scientists engineered a version of the polio virus that would not infect normal cells, but would infect and replicate in glioblastoma cells. The therapy was to inject the engineered virus directly into the glioblastoma tumor. The treatment produced shrinkage to disappearance of the tumor. Dr. Gromier quickly noted this effect was not due to the lytic effect of the virus, but rather to the fact that the viral infection stimulated the immune response in the brain. In particular, there was a “whopping” increase in the type 1 interferon response and that dendritic cells were stimulated to present antgens. This approach to glioblastoma therapy is currently in a phase 1 clinical trial and was a featured in a 60 Minutes story on March 29, 2015. (See: http://www.bioquicknews.com/node/2494). Next, Daniel Simon, Vice President of Pharma Business Development at Guardant Health, and John Strickler, MD, Assistant Professor of Medicine and Member of the Duke Cancer Institute, spoke on the detection and analysis of circulating tumor DNA (ctDNA) in “liquid biopsies.” Guardant Health uses proprietary digital sequencing technology to identify a patient’s individual genomic alterations from the noise of interfering data that is inherent to standard next-generation sequencing technologies. The company’s Guardant360 analysis looks for actionable somatic mutations across all solid tumor sites. Mr. Simon believes that the analysis of ctDNA can drive greater actionability for patients with the approximately 1,500 anti-cancer drugs that are currently available. Dr. Strickler spoke in particular about colon cancer and the need for novel therapies for this cancer that can become refractory to chemotherapy. Liquid biopsies of ctDNA offer the opportunity for greater insight into the cancer and for target discovery. He gave an example of one colon cancer patient whose ctDNA analysis failed to show MET ctDNA, but did show Her2/Neu ctDNA, which is very rare in colon cancer. Based on this finding, the patient was treated with breast cancer chemotherapy and showed a dramatic response. Eric Schadt, PhD, Director and Founder of the Icahn Institute for Genomics and Multiscale Biology at the Icahn School of Medicine spoke on the information-driven approach and machine learning as enabling the reinvention of medicine. He noted that the largest automobile company today (Uber) owns no cars and the largest hotel company (Airbnb) owns no hotels. He predicts that in the future the largest health company will own no hospitals, but will be driven by individual implantable, portable, and wearable devices. According to Wikipedia, “Schadt’s work combines supercomputing and advanced computational modeling with diverse biological data to understand the relationship between genes, gene products, other molecular features such as cells, organs, organisms, and communities and their impact on complex human traits such as disease. He is known for calling for a shift in molecular biology toward a network-oriented view of living systems to complement the reductionist, single-gene approaches that currently dominate biology to more accurately model the complexity of biological systems.” Dr. Schadt noted that he and some 300 colleagues from Mount Sinai, will soon be leaving to start a new company called Sema4 (http://sema4genomics.com/) that will be in the reproductive health space. Originating from the Mount Sinai Health System in New York City, Sema4 is an interdisciplinary partnership of scientists, doctors, engineers, clinicians, and genetic counselors. With a strong foundation of more than 160 years of clinical experience, world-class academic research, and pioneering information science, the company leaders believe it is uniquely positioned to drive innovation in health. It further believes that the synthesis of information science and machine learning with the power of biodata at scale will revolutionize our ability to diagnose, treat, and prevent disease. At the center of the company’s pursuit is a strong commitment to engaging patients as partners and sharing the data, so that every patient’s journey helps complete the greater picture. Jeffrey Rogers, PhD, Global Research Leader, Cognitive Internet of Things (IoT) for Healthcare, IBM, spoke about creating spaces with layered sensing and described, in particular, a house on the IBM campus in which Parkinson’s patients live during the day and data is gathered on a wide variety of parameters, such as gait, that can provide insight into the individual’s disease. He emphasized the importance of having the patient’s trust in these studies. At the end, he noted that the analysis of two minutes of speech can provide a wealth of information, for instance, distinguishing among control, manic, and schizophrenic individuals. John Ryals, PhD, President, CEO, and Chairman, Metabolon, spoke about how metabolomics provides a snapshot of an individual’s current health state and actionable clinical information, making it a valuable first-line health assessment tool. He said Metabolon is focused on the world of small molecules and, in particular on 2,000 small molecules that can be identified with clinical precision by mass spectrometry techniques. These are 2,000 small molecules in the plasma that are maintained homeostatically and, of these, 250 are bacterial in origin. He noted that the data quality of the metabolite analysis continues to improve and that the standard deviation was 48% in 2005 and in 2016 was less than 4.5%. He gave an example of a small molecule (dimethylglycine) whose concentration is not affected by age, but is affected by disease. He highlighted Archibald Garrod’s classic book “Inborn Errors of Metabolism,” published in 1909 as an early marker of the connection between metabolic defects and disease. Recently, Metabolon has worked with Arthur Beaudet, MD, Professor and Chair of Molecular and Human Genetics at Baylor College of Medicine to demonstrate the capability of their system to specifically detect known metabolic defects and avoid false positives. Dr. Beaudet provided Metabolon with 200 blinded samples of 70 healthy controls and 130 metabolic disease samples. Metabolon identified 70/70 controls correctly and 129/130 metabolic disease samples. And there was an explanation for the one disease sample missed. Dr. Ryals described Metabolon’s Meta IMD™ test, which was launched in September 2016 as a CLIA laboratory-developed test and is an adjunctive, first-line clinical tool that can save time to diagnosis and potentially thousands of dollars in associated costs. It offers a comprehensive analysis of hundreds of metabolites associated with a wide range of inherited metabolic disorders (IMDs). Meta IMD is not meant to replace diagnostic testing for specific conditions, but provides detailed biochemical information to assist physicians in deciding what additional clinical tests are needed to confirm or clarify a diagnosis. The test requires only 250 µL of plasma. It simultaneously surveys individual metabolites and pathways across amino acids, carbohydrates, organic acids, fatty acids, neurotransmitters, nucleotides and bile acids to detect biochemical abnormalities associated with a wide range of IMDs. Meta IMD may also spot disorders for which there is presently no biochemical testing available. Results are typically delivered in about 21 days. At the end of the two-day PMWC 2017 Duke meeting, Dr. Ryals hosted a tour of the Metabolon lab site that is located not far from Duke in Durham, North Carolina. Elaine Mardis, PhD, Co-Director of the Genomics Institute at the Nationwide Children’s Hospital in Columbus, Ohio, and former Co-Director of the McDonnell Genome Institute at Washington University in St. Louis, outlined various computational tools used to interpret cancer genomics data in the context of targeted therapies. She highlighted a website—“Clinical Interpretations of Variants in Cancer” (https://civic.genome.wustl.edu/home)--that carries out evidence curation by crowd sourcing to provide a resource for the clinical interpretation of cancer variants. She also referenced the “Drug Gene Interaction Database” (http://dgidb.genome.wustl.edu/) that is a for-research-use-only database for searching on interactions by gene or drug name. She gave an example of an n-of-1 study in which sequence analysis of a low-grade glioma in a 12-year-old child revealed a 3-base-pair insertion in BRAF. The child was treated with a RAF inhibitor and is doing well two years out, Dr. Mardis reported. She said that future progress would be sped by high-throughput functional genomics, work on model organisms, the development of new genomic tools, and the broad communication of advances. Antony Rosen, MD, Director of the Division of Rheumatology at the Johns Hopkins School of Medicine, spoke about investigating a curious link between cancer and autoimmune sclerodoma. Normally, he said, it is rare to see both diseases occurring at the same time. However, his group identified a subgroup of patients for which this phenomenon occurred in 20% of the cases. This subgroup was characterized by having a mutation in the gene for RNA polymerase III. Dr. Rosen suggested that this mutation initially elicited an immune response directed against the mutation, but later that immune response broadened to be directed against wild-type RNA polymerase III, initiating the autoimmune disease. He closed by emphasizing the power of anchoring today’s revolutionary tools of measurement to disease biology. Please stay tuned to BioQuick News for additional stories on the two-day PMWC 2017 Conference at Duke. Additional stories on Day 1 will focus on patient access to investigational drugs, on ME/Chronic Fatigue Syndrome as a mysterious illness that science has yet to unravel, and on the evening presentation of Pioneer & Luminary awards to distinguished figures in precision medicine. Day 2 stories will also follow.